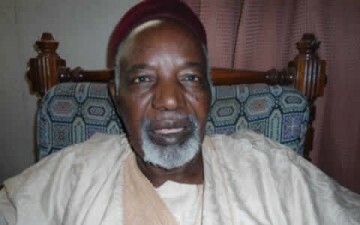 Alhaji Balarabe Musa, a former governor of old Kaduna state, has asked Nigerians not to show any sympathy for former president, Chief Olusegun Obasanjo. The outspoken ex-governor also lambasted Goodluck Jonathan over the accidents encountered on Lagos—Ibadan ex­pressway, stating that the immediate past president and Obasanjo are reaping the fruits of their past deeds. According to Daily Post, Alhaji Musa, who spoke after the incidents, said the two former leaders should apologise to Nigerians for not meeting the demands of their office concerning that road and that they only decided not to fix the road. “When both of them were in office, they budgeted billions of naira for con­struction work on that expressway and other ones across the country, but that was where it ended as the money voted for the work on the road usually mend in private pockets. have also become victims of negligence of that highway, the authorities should let them lick their wounds as they soberly reflected that when they had the opportunity to fix the roads, they failed to do so. “What happened to Obasanjo and Jonathan should now serve as a wake-up call to Buhari. As the sitting president of the country, he should order a probe into how billions of naira voted for construction and repair works on the roads ended in private pockets. “The stolen money should be retrieved while those involved no matter how highly placed should be put on trial for economic sabotage instead of us sympathizing with Obasanjo and Jonathan. “They are the ones who owed Nigerians an apology for failing to perform their duties when they were in power. “The state of our roads across the country is very shameful. Most of them are death traps. For an oil-producing nation, this is a big shame and embarrassment. But these carnages on our roads is enough, and this is why Buhari must go all out to apprehend those who are responsible for the deplorable state of our roads. “It serves both Obasanjo and Jonathan right to have a taste of what average Nigerians suffer as a result of bad state of our roads,” he explained. Yes Baba Musa is correct and right. Only the supporters of evil will not agreed with you. Obasanjo is evil and liar.